Minnesotans are known for enduring some tough winter weather conditions. But they do so, perhaps, because of each preceding fall season, when there seems (to us) to be no better place on earth. Fall in Minnesota is a glorious time and perfect for enjoying the beauty of the season with a round of golf. Any golfer looking for a great round wants the course to be in peak condition, and fall in Minnesota is when the turf conditions are at their finest. The cooler temps prevent baked-out fairways that can occur during a hot summer, and course superintendents have an entire season to groom their courses to its desired best. Unscarred tee boxes, verdant, manicured fairways (with some challenging rough, of course) and greens that roll fast and true. The conditions are unsurpassed. Summers in Minnesota can be hot and humid, but the falls are cool and dry and simply beckon golfers to tee it up. A round in the mid-70s, with a warming sun peeking between clouds, offers the perfect oasis for a golf traveler. It’s as if you set the thermometer to the precise temperature for golf. If it is your last round of the season, you won’t do better for finding a round that will make you yearn for golf coming next year. There are four seasons in the Land of 10,000 water hazards, and fall is the most majestic — with a round of golf providing a front row seat. The splendorous falls colors (particularly in the deep woodland course in Northern Minnesota) are a feast for the eyes, but the rustle of leaves and smell of crisp, cool fall breezes also arouse other senses. Waiting to play your next shot allows time to soak in the surroundings and likely put you in the perfect mindset to take it. 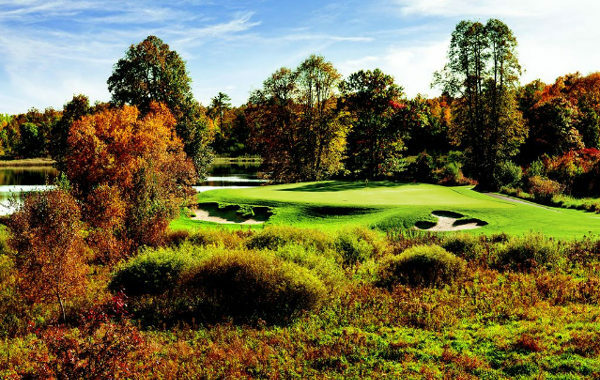 There might not be much waiting for shots, however, as fall golf is a time for uncrowded courses. Junior players are back in school while other players have stopped playing for the season. The result is open, optimal tee times, which is a great benefit for the golf traveler. And that goes hand-in-hand with good prices on golf in the fall, as courses looking to capture the waning golf dollars offer plenty of deals to those still playing. Doing a little online research will reveal some creative pricing (such as The Wilds’ “Pay the Temperature” green fee deal) and offer the opportunity to stretch your travel budget and still play great courses. You have the opportunity for so much more than fall golf while on a trip to Minnesota, so pairing your rounds with another local sports activity takes great advantage of your time. The Vikings, Twins, Wild and even the Timberwolves could be playing in town during your stay (and perhaps even hosting your hometown team), so sports fans can knock off a “sports two-fer” with a beautiful round by day and an exciting professional sporting event by night. If you prefer participating rather than spectating, try out one of those 10,000 water hazards (nee: lakes) for a restful afternoon fishing for your shore lunch. In the central lakes region, there as many golf holes (Cragun’s, Madden’s, Grand View Lodge, Breezy Point, and Golden Eagle among them) as fishing holes to accomplish both. Finally, the Twin Cities is a great center for the arts (Guthrie Theater, Walker Art Center, Minneapolis Institute of Arts, the Minnesota Orchestra, to name a few), so your trip can excite art lovers as well as golfers. Fall is a great time of year for seeing beauty indoors as well as outside, and Minnesota is the place to do it. With this many reasons to play golf in the fall, we’re not sure why anyone would pass up the opportunity! So, get out there before the snow flies. You won’t regret it.